Avishkar, the network device management framework from ThinkPalm, is an intuitive solution aimed at managing network switching equipments. The network device configuration management framework offers network administrators the liberty to choose from various user interfaces like WebUI, CLI, SNMP and NetConf. The solution is inclusive of a designer software that acts as a front-end to the user to create and manage CLI commands graphically and generate CLI, WEB and SNMP source codes corresponding to the protocols. In a nutshell, the on-device management solution reduces the time and resources required to develop network management applications. The framework is focused on developers involved in network interface coding like CLI implementation, SNMP or web support for a new protocol/ feature added to network devices. Network admins often demand a system that supports the seamless extension of an existing management system or the implementation of a new one, depending on client requirements. Network device management calls also for faster integration of L2/L3 layer protocol interfaces and the capability to choose internal or external databases. ThinkPalm has factored in requirements of the like in the solution to ease the task of developers. Creation of a designer software capable of generating CLI code automatically proved to be a trial for the team. Other difficult tasks included incorporating MIBs with CLI commands and generating common layer code, simultaneous creation of code for the multiple user interfaces employed – CLI, WebUI, SNMP, NetConf and the implementation of complex technologies such as L2 protocols, NFS and Net-SNMP. The unparalleled solution is capable of easily incorporating with or extending an existing management system and boasts of an easy-to-use interface (CLI with SSH/Telnet support, WebUI, SNMP, NetConf). Source codes are generated automatically for the engines and agents. The easy addition of new user interfaces and L2 protocols with minimal overhead makes Avishkar a cut above the rest. The framework supports a three layer architectural design, namely engine, agent and OS interface layers. Engine layer is composed of separate engines, specific to each user interface and performs reception, parsing and interpretation of commands corresponding to each interface. 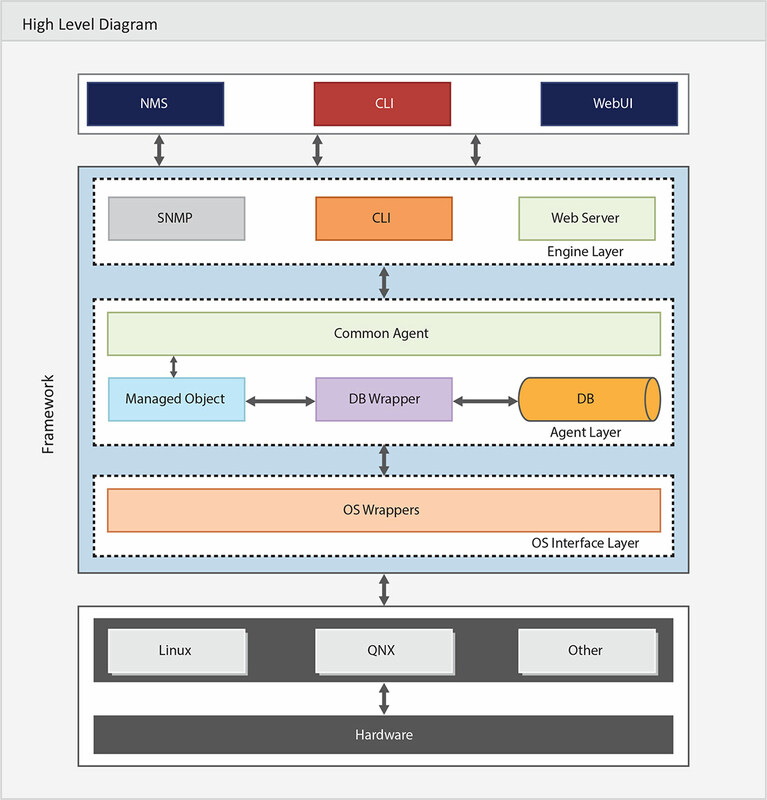 Agent layer is common to all engines and accounts for protocol and database management. OS interface layer provides interfaces for various operating systems, maintaining operating system independency. The designer software, which is the graphical user interface of Avishkar, is used to design the CLI commands structure for a network device. Each command is associated with an object identifier (OID), the standard identifier used in SNMP. After the design, automatic code generation for the engine and agent layers is achieved in a matter of few clicks using the designer software. The system offers the flexibility to modify the automatically generated code in future if required. 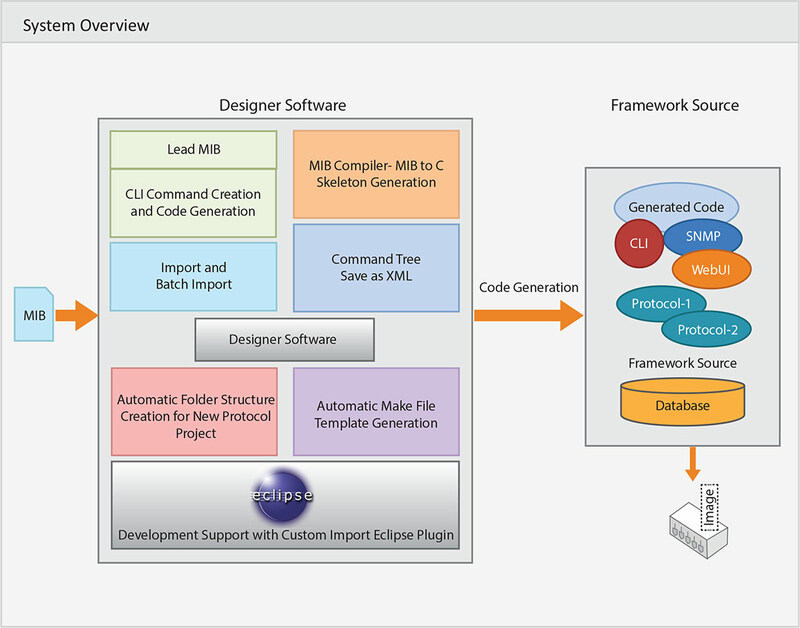 An open source, light weight, system level process manager PCD is employed in the solution that provides enhanced control and monitoring of all the processes in the system. Avishkar is the go-to solution for all network managers who aspire to reduce the development time through an inexpensive, flexible, easily extendable and developer friendly interface. The single data storage employed facilitates quick and reliable access to data. Enhanced system stability, debug capabilities and a graphical representation for quick analysis are made possible by PCD used for process control. The seamless integration or extension of an existing management system, faster integration of new protocols and NFS support for faster development are key benefits developers can leverage. Avishkar’s data protection, abstraction and integrity aspects make it one of the most sought after solutions in the network management arena.